Gentrification is a common phenomenon in cities around the world. Gentrification – which describes the influx of affluent and educated people into former working class neighbourhoods – is a major concern in numerous cities around the world. While civil society and world leaders call for more inclusive growth (e.g. OECD 2018), many fear that large changes in the social composition of neighbourhoods may price out less advantaged residents and inflict on them various social and economic costs (e.g. Autor et al. 2017, Cohen 2018). Urban planners are increasingly willing to adopt preventive policies to temper these large neighbourhood changes and to assist the potential losers of gentrification. However, the implementation of such policies faces a simple practical problem: given the very localised nature of this phenomenon (Hwang and Lin 2016) and its apparent idiosyncrasy, how can future spots of gentrification be anticipated? In recent work (Behrens et al. 2018), we study gentrification in New York and Philadelphia between 1990 and 2010 and provide evidence on the micro-geographic scale of gentrification and the role that businesses play in that process. Emphasising the role that specific sectors play at early stages of the gentrification process, and identifying the list of those sectors, is one contribution of our paper, as most of the literature has focused on the demographic characteristics of residents only. It is also of direct interest for urban policy as business-level data are available at a higher frequency and at a smaller geographic scale than standard census data. Hence, putting establishments at the core of the analysis of gentrification is useful to quickly and accurately detect areas that are likely to gentrify in the near future. We follow the literature in social sciences to identify gentrifying neighbourhoods in New York over the decade 1990-2000. We consider that a block gentrifies over the decade if it was initially poor (with average income below the median in 1990) and if it experienced a substantial increase in its per capita income and its share of college-educated residents relative to the rest of the urban area.1 Figure 1 depicts the location of neighbourhoods that we identify as gentrifying between 1990 and 2000 in the New York metropolitan area. Two interesting facts emerge from this exercise. First, gentrification does not necessarily take place in the city centre. As expected, we observe several spots of gentrification in Manhattan and Brooklyn, but also in Queens and in New Jersey (i.e. at more than 10 kilometres from the city centre). Second, gentrification is highly localised and does not follow existing administrative boundaries. For instance, it is common to see that only a small fraction of blocks within a census tract gentrify while others do not experience any specific changes. Working at a very fine spatial scale is thus key when one is interested in the geography of gentrification and its consequences for neighbourhoods and residents. Knowing where gentrification takes place in New York between 1990 and 2000, we are then able to study the initial composition of these neighbourhoods in terms of business establishments. We document that some establishments exhibit very atypical location patterns: they usually locate in rich neighbourhoods, but we also disproportionately find them in poor but soon-to-gentrify areas. These businesses belong to a small group of about 20 industries that are mostly linked to cultural, recreational, and creative activities. For instance, we find that artists, architects, and art dealers are businesses that are (conditional on current socioeconomic characteristics) systematically over-represented in poor neighbourhoods that will gentrify in the subsequent decade. Social scientists interested in gentrification have long documented the early presence of the creative class in gentrifying neighbourhoods (Ley 2003). However, we are the first to provide quantitative evidence on this phenomenon and to identify from the data this list of pioneer businesses that is not an ad hoc one. To assess the relevance of pioneer industries in detecting gentrification spots beyond the initial sample used to identify these pioneers (i.e. New York in 1990-2000), we perform various prediction exercises. Where does future gentrification occur, conditional on many socio-demographic characteristics and physical amenities (distance to parks, transport, waterfront, etc.)? We show that accounting for the initial presence of pioneer businesses in 2000 increases the probability of correctly predicting that a block will gentrify in either New York or Philadelphia between 2000 and 2010. Quantitatively, including this variable increases the accuracy of our predictions by up to 200 metres compared to a prediction exercise that does not account for the initial presence of pioneers. Based on estimated gradients of house price appreciation around those blocks, this is equivalent to a potential gain of up to 19 percentage points of that appreciation. We also find that the presence of pioneers matters at least as much as spatial contagion – i.e. distance to the closest block that gentrified over the previous decade – in the gentrification process. Why do pioneers precede gentrification? We argue that the strong predictive power of pioneer businesses reflects their role in the gentrification process. First, we find that pioneer industries employ workers who have typical characteristics of ‘gentrifiers’: their workers tend to be young, educated, and often single or in ‘power couples’. Furthermore, as shown in Figure 2, they disproportionately live close to their workplace, as they work often at home, and commute by bicycle or by foot more often than workers in other industries. Hence, pioneer businesses located in upcoming neighbourhoods come hand-in-hand with a new type of residents. 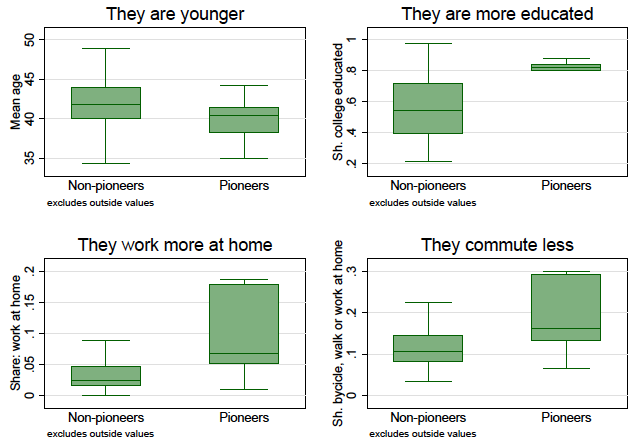 Figure 2 How different are workers in pioneer industries? We also find that pioneer businesses may enhance gentrification through a signalling effect. Their presence provides information on a neighbourhood’s prospects for potential investors and other businesses, and signal that the neighbourhood will improve in the future. Last, we show that pioneer businesses are not intrinsically valued as amenities by local residents – their presence does not seem to be a direct attractor of wealthy and educated people. However, we do show that their presence in a block is associated with the future arrival of several consumption amenities, including restaurants and bars. Pioneers may thus indirectly contribute to the influx of young and educated residents, through the rise in consumption amenities that follows their arrival in the neighbourhood. Analysing gentrification with establishment data provides novel insights on the interplay between businesses and residents at a micro-geographic scale. Using this information is potentially important to anticipate where gentrification will take place. As neighbourhood changes are highly localised and sometimes very fast, this is a useful basis for better informed and more targeted urban policies.